The outdoor entertainment area needed to compliment and flow from the main beach house; it also needed to provide privacy from the road and shelter from prevailing winds. A wood-fired pizza oven and a functional fireplace with a hot plate and rotisserie was also requested. As the area was intended to be used also at night, suitable outdoor lighting was also part of the brief. All the above was achieved in the design. The link to the house was reflected by incorporating similar angles and materials - including river stone patterns. 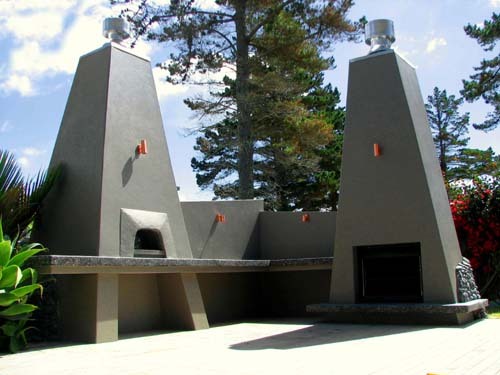 Privacy and wind protection was achieved by angled walls that linked the wood-fired pizza oven and fireplace towers. In keeping with the beach setting, the polished concrete benches incorporated shells in its design. Lighting was strategically placed so as to provide functionality but also to highlight aesthetic aspects of the design.